Thoroughly completed in 1839 after a three-year construction during the reign of King Rama II whose aim was to tribute to his daughter, Wat Thepthidaram (means Temple of the Angel) is famous for its architecture influenced by Chinese arts, especially its ordination hall. Wat Thepthidaram was also the former residence of Sunthorn Phu, one of the greatest poets in Thai history, during his monkhood in 1840-1842, whose biography is shown at the museum located within the temple compound. Opening hours: Daily 8 a.m. - 5 p.m. The Wat Thepthidaram ( Thai วัด เทพธิดา ราม , Temple of angel daughter , full name: Wat Thepthidaram Woraviharn - วัด เทพธิดา ราม วรวิหาร ) is a Buddhist temple ( wat ) in the inner region of the Rattanakosin -Insel in Bangkok . The plant was built between 1836 and 1839 by King Rama III. built in honor of his eldest favorite daughter Vilas (full name: Krommamuen Apsorn Sudathep , กรม หมื่น อัปสร สุดา เทพ ). Wat Thepthidaram is a Third Class Royal Temple . Although King Rama III. 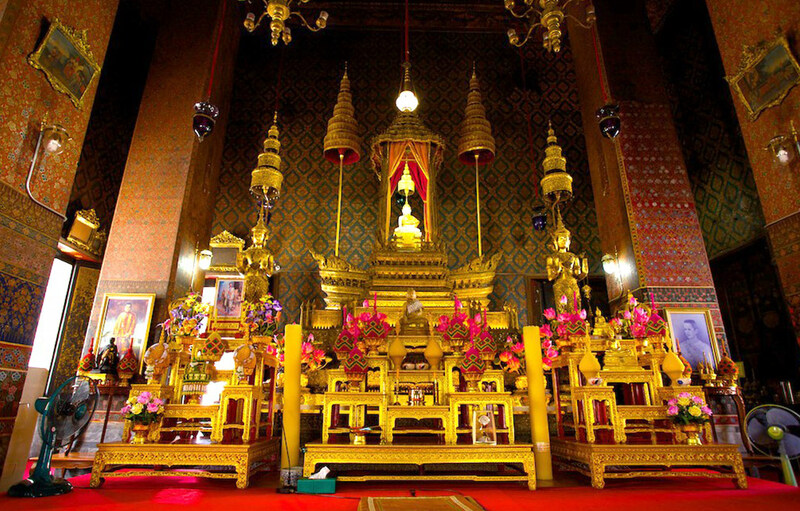 Having already restored several temples in Bangkok, Wat Thepthidaram was the first rebuilding of his reign. Construction in the then Suan Lauang Phraya Krai ( สวนหลวง พระยา ไกร ) district on the Samran Council Gate ( ประตู สำราญราษฎร์ ) was overseen by site manager Prince Laddawan. This place was remarkable in that it was at that time a transport center for the eastern Rattanakosin island: directly north ran a connecting channel ( Khlong ) , which is now called Khlong Wat Thepthidaram. It connects the inner city fortification channel, the Khlong Lord with the Khlong Robb Krung (literally: "canal that encloses the whole city"). About the Khlong Maha Nak ( คลอง มหานาค) there was a direct connection from the royal palace to the eastern parts of Siam . When the temple was completed in 1893, during the opening ceremony, the king personally tied the ceremonial ribbon around the temple and officially granted him land rights. 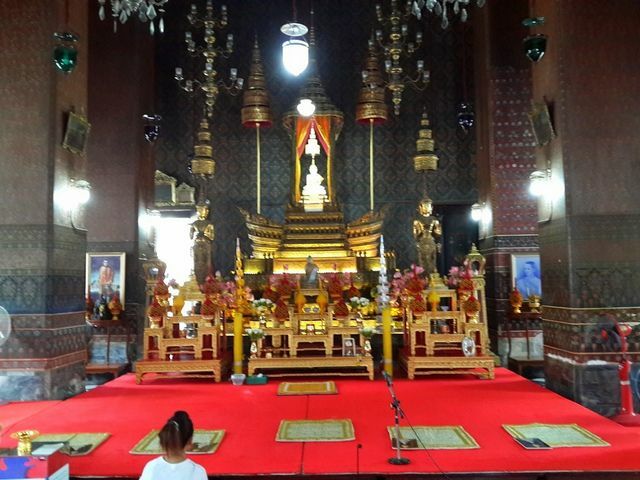 Phra Ubosot or Chapel is a place for religious ceremony, such as reciting of Prātimokṣa (Fundamental rules of Buddhist monks) on Buddhist day of observance and ordination ceremony. Bai Sema (Buddhist stone marker in Thai temple) and Kampheng Kaew (low wall) can be found outside, separating the Ubosot during Buddhist ceremony. Inside the chapel, Phra Phutta Thewawirat or Luang Por Khao (the White Buddha) is the principle Buddha image of the building. The Buddha image sits on Vechyanbusabok, an artistic reflects of the throne of Indra. In front of Luang Por Khao, two standing Buddha images in the post of calming the ocean stand in full regalia. On the right, the picture of Princess Wilat drew and donated to the temple by the Fine Art Department, Ministry of Culture. On the other side, a statue of King Rama III, the founder of the temple, can be found. Outside the Ubosot stand four pagodas in each direction. 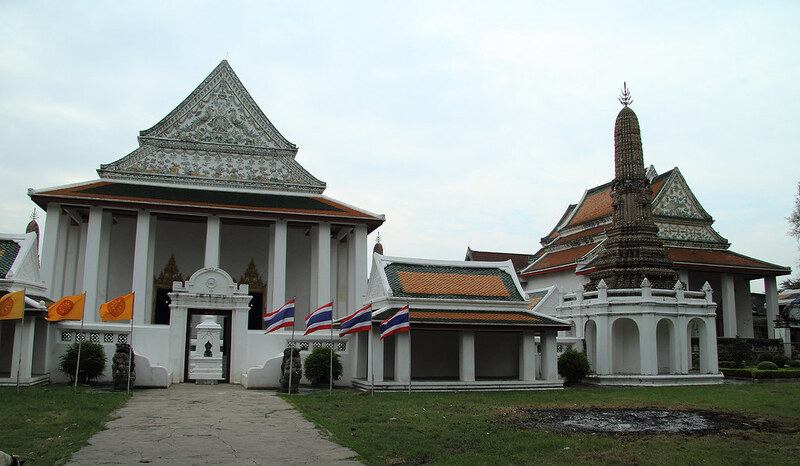 These pagodas were built in a unique fashion of early Rattanakosin period in the form of “corn shape” pagoda, which is characterized by tall and steep tower that slowly shrink and round up on the top, similar to the shape of a corn. The total height of each pagoda is 15 meters, including the 5 meters octagon foundation. Each pagoda stands in the cardinal direction with Thao Chatulokaban, the Buddhist four heavenly kings, house inside the housing part of the pagoda. The stone pillars in front of each pagoda were carved into stone incense with Chinese dragon adorning the surface. There were four Buddha images installed at the foundation of every pagoda. However, three of them were stolen from the temple over the years. The Ubosot is used for religious ceremony and only open to public visit during following hours. Visit: 7.30 am. – 6.00 pm. Religious routine (Buddhist visitor can participate): 8.30 am. and 7.00 pm.